Vaseline, which is petroleum jelly, has been around for a very long time and we have been using it to keep our skin and lips soft and supple. There are many more uses of Vaseline that you probably haven't thought about! Read more to find out! • Apply Vaseline on your eyebrows at night to make them long! • Can't get your bangle or earring in? Just apply a little Vaseline on your hands and ears and/or the jewellery to make it slip in easily. • Touch up your shoes and boots with a little Vaseline to make them look as good as new! • When you want to colour your hair, apple Vaseline on your hairline to prevent getting dye on your skin. • Vaseline makes an excellent makeup remover! • Make your own scrub by mixing Vaseline and sea salt. • If you are crazy about perfumes and want it to stay longer, apply a little Vaseline and then spray perfume. The fragrance stays longer. 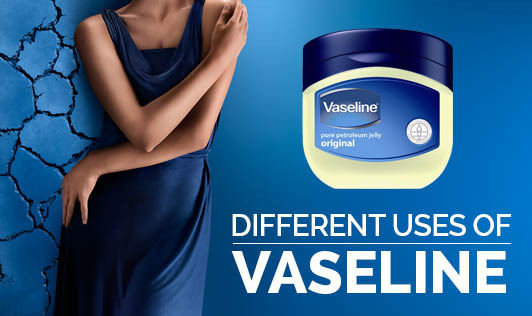 • Vaseline is found to remove makeup stains from clothes. Keep your bottles of Vaseline ready! You may need it anytime!